A world of experience lands in Puerto Vallarta for the 20th Festival Gourmet. Chefs from every corner of the globe will be sharing their talents and best cuisine from November 13 through 23, 2014 at various restaurants across the city and Banderas Bay. Restaurant Kaiser Maximilian has been participating in this yearly event since the beginning and this year they are proud to have Chris Bradley as their guest chef. He is currently the Executive Chef at Untitled located in the Whitney Museum of American Art in New York, New York. His cuisine at Untitled is described as upscale diner food with contemporary flair and farm-to-table cuisine. Untitled serves a seasonal, all-day menu featuring updates on coffee shop classics which are all made with carefully sourced, local ingredients like freshly baked breakfast pastries, eggs and omelets, pancakes, salads, soups, sandwiches, burgers, and entrees. Untitled is proud to feature artisan ingredients and products from local sources. 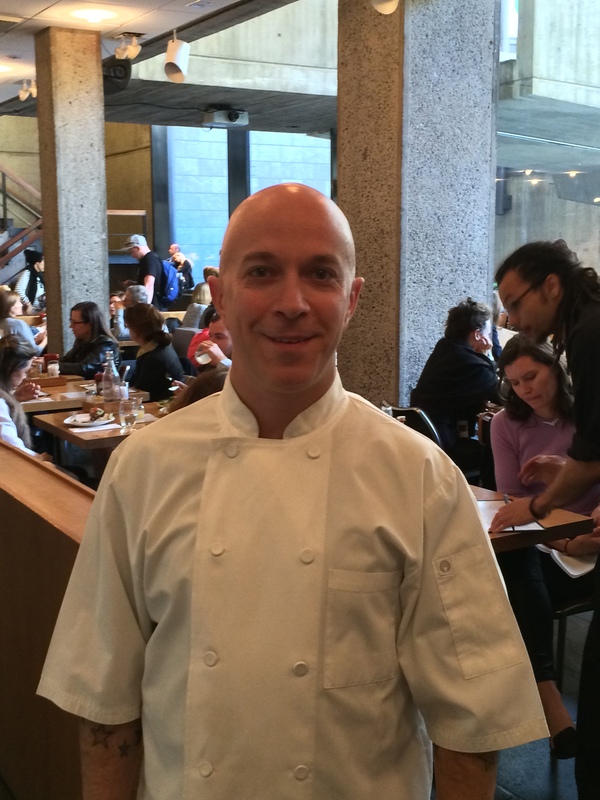 Chris has worked in stellar restaurants and his diverse culinary experience will be featured during Festival Gourmet. His past is quite interesting. After receiving a medical scholarship, Chris attended the prestigious University of North Carolina at Chapel Hill, where he earned a degree in English and philosophy. After graduation he decided to turn his longtime love for cooking into a full time career by traveling to the Appalachian Mountains where he was appointed head chef at Marketplace restaurant in Asheville, North Carolina. Bradley later completed his formal culinary education graduating from the New England Culinary Institute in 2001. During his training, he apprenticed at Café Boulud, eventually earning a full time position.There, he worked under Andrew Carmellini (now the Executive Chef at Locanda Verde and The Dutch), as well as Jean Francois Bruel (Executive Chef at Daniel). He then cooked at Charlie Palmer’s Aureole, moving from there to take over Astra, Palmer’s Upper East Side events space. Two years later he assisted with the opening of CP Steak DC in Washington. Chris then landed at Brooklyn’s Saul, where he was part of the team that helped the restaurant land a Michelin star-the only non-Manhattan Michelin star in the first NYC guide. He later returned to DC as Executive Chef at Ardeo/Bardeo, restaurateur Ashok Bajaj’s casual American restaurant and wine bar. In April of 2007, Chris returned to NYC as a sous chef at Gramercy Tavern. Three years later, he was promoted to the Executive Sous Chef position, before becoming the opening Executive Chef at Untitled in 2010. He has been there ever since. Enjoy the special menu items Chris has created especially adapted for Kaiser Maximilian. Some will become part of the regular menu. This entry was posted in Prensa and tagged Festival Gourmet Puerto Vallarta, Puerto Vallarta Restaurants. It was a wedding of epic proportions that celebrated the marriage of Crown Prince Ludwig, later to become King Ludwig I, and Princess Therese of Saxony-Hildburghausen on October 12, 1810. The people of Munich were invited to attend the festivities held on the fields in front of the city gates to celebrate the happy royal event. Today Oktoberfest is the largest festival in the world, with an international flavor characteristic of the 21st century. Around 6 million visitors from all around the world converge on Munich for Oktoberfest every year and food is a big part of the party. In Puerto Vallarta, Mexico, you can celebrate Oktoberfest all month long at Kaiser Maximilian restaurant. There’s a special menu featuring dishes from Germany in addition to the traditional Austrian fare served at this very popular south side restaurant. Come out and celebrate Oktoberfest at Kaiser Maximilian through October 31st. Whether dining al fresco at the European-style sidewalk café tables or in the intimate air-conditioned dining room, you’ll enjoy the fabulous cuisine, professional service and elegant atmosphere that have made Kaiser Maximilian one of Puerto Vallarta’s favorite fine dining restaurants. This entry was posted in Prensa and tagged Kaiser Maximilian Puerto Vallarta, Oktober Fest kaiser Maximilian, Puerto Vallarta Restaurants.